I just watched Mishima: A Life in Four Chapters, Paul Schrader’s strange 1985 biopic (if it can be called that) of the Japanese writer Yukio Mishima, who committed seppuku, or ritual suicide, in Tokyo in 1970 after a failed attempt to inspire an uprising against the post-war state by the Japanese army. I’d wanted to watch the film for a long time, mainly because I am a big fan of Paul Schrader (Taxi Driver has been one of my favourite movies since watching it in a film studies class at school) but also because Mishima is such an interesting figure. 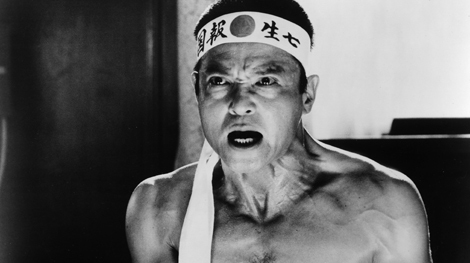 Mishima was a real-life Schrader (anti-)hero – lonely, ascetic, tortured and ultimately self-destructive. But this is also a film about the struggle to reconcile life and art – or, as Mishima put it, to achieve “the harmony of pen and sword” – which is why perhaps critics see it as Schrader’s most personal film. Watching the film I was also struck by the parallels between post-war Japan and Germany (but see Ian Buruma’s The Wages of Guilt for an excellent comparison of the different ways the two countries have dealt with their wartime pasts). In both countries, defeat in World War II was cultural and intellectual as well as military: in both cases, the post-war democracy that was established more or less successfully – above all by the Americans – represented a break with national traditions, in particular a warrior-ethos that in Japan was embodied by the samurai tradition. In both cases, this post-war order – associated with the United States – that produced spectacular economic success was challenged by extremists of both the right and left with both the pen and the sword. In 1968, by which time he was Japan’s most famous and internationally successful author, Mishima set up his Tatenokai, or Shield Society, a private army very much like the Freikorps in twenties Germany or its successor the SA (it brings to mind Klaus Thewelweit’s Male Fantasies on this kind of hypermasculine culture). Mishima (whose favourite writer, incidentally, was Thomas Mann – particularly early Mann and above all Death in Venice, I would guess) had an ideology that seems to me reminiscent of German romanticism – particularly in its fetishisation, and aestheticisation, of death. In the context of post-war Japan, Mishima stood for the restoration of a kind of Japanese spirit that had been eroded by capitalism and Americanisation and in that sense reminds me of figures like Martin Heidegger, Carl Schmitt and Ernst Jünger in post-war Germany (although Mishima, born in 1925, was much younger). While Mishima attacked the post-war order (embodied by the Liberal Democratic Party) from the right, other young Japanese people attacked it from the left. There are particularly striking parallels between the New Left in Japan and West Germany. It has frequently been pointed out, for example, that 1968 turned particularly violent in both countries: Nihon Sekigun, or the Japanese Red Army, grew out of the Zengakuren, or All-Japan Federation of Student Self-Government Associations, much as the West German Red Army Faction grew out of the SDS. What I find interesting is that Mishima expressed sympathy with the Japanese student movement – both, for example, were anti-American and anti-capitalist – but unlike them he wanted to restore the emperor to his pre-war status. In a great scene in Schrader’s film, we see Mishima’s famous clash with the helmeted Zengakuren in 1968. “We are both playing with the same cards, but I have a joker — the emperor,” he tells them. This entry was posted in 1968 generation, film, German intellectual history and tagged Germany, Japan. Bookmark the permalink.